Over the coming Bank Holiday Weekend from Saturday 30th April until Monday 2nd May I shall be showing my sculpture at ‘Art for Cure’ an exhibition in aid of a charity which supports the treatment and care of breast cancer patients. It was started by two women in Suffolk, who both suffered from the condition and have thankfully survived. They are inspirational people who are working extremely hard to promote their work and I am very happy to support their efforts. The exhibition at Glemham Hall, a beautiful historic house not far from Aldeburgh will show paintings and sculpture in the Hall, plus garden sculpture outside. There will be lots of ‘arty’ events to complement the exhibition, including things for children to do, so it should be a happy event for all-comers. How I carve stone for sculpture for interiors. Rodin is reputed to have said, ‘I choose a block of marble and chop off whatever I don’t need.’ Indeed this method is often referred to as ‘direct carving’ and I sometimes work in this way, working from my imagination from a piece of stone which I happen to have in stock. However, my sculpture for interiors are generally all in stone which I carve from specially selected blocks. 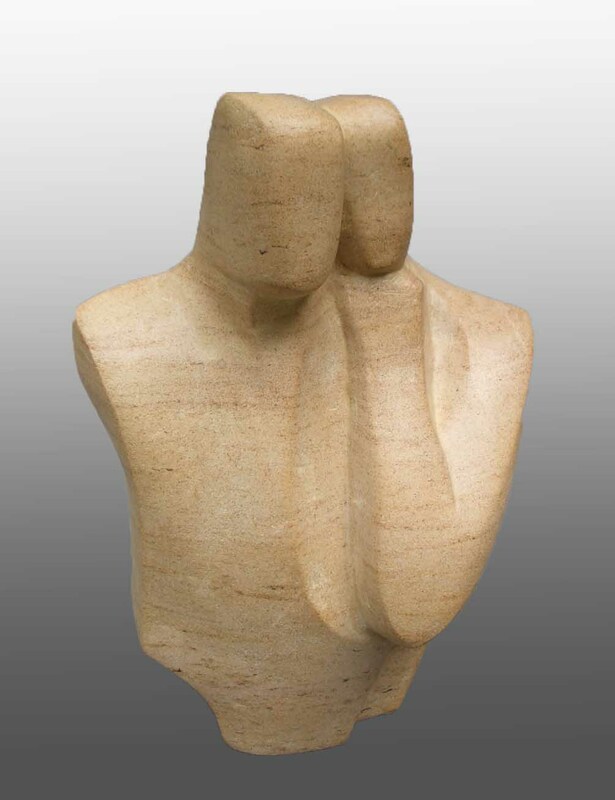 Over the years I have carved unique pieces in a number of different stones, from Carrara marble to alabaster and limestone. Nowadays I use two English stones for my interior sculpture, both of which suit UK decors. The first is Ancaster limestone, which is from Lincolnshire, and is a lovely creamy colour with subtle slightly dark markings. It looks particularly good in contemporary interiors with natural colour schemes. It is a very ‘reliable’ stone (i.e. it doesn’t break or flake off during carving) and can be finished to a good polished surface. The other stone I use is soapstone from a quarry in Cornwall – this is dark grey/black, often mottled with greens and iron colours. Visually it makes a good contrast to Ancaster. Soapstone is quarried in many parts of the world and some, such as that used by the Inuit people, is very soft, hence its name, and it can be whittled away rather than carved. The soapstone I use is much harder and more durable and can be highly polished. The tools I use include chisels, claw tools, bolsters, rasps, and rifflers, each for a different stage in carving. These can be bought from specialist sculpture suppliers online. It is worth paying for good quality tools as they will last many years and produce the best result for your sculpture.